Check out this natural alternative to cold medicine. When someone in my house is sick, I like to reach for the healing powers of food to help them feel better. 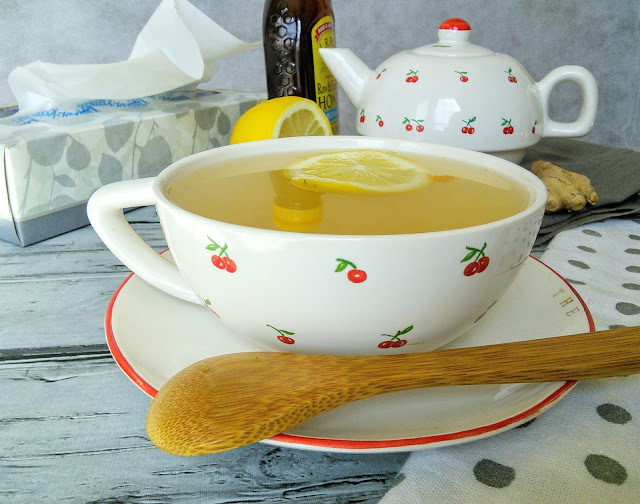 Last year I discovered a wonderful soothing tea recipe that not only helps relieve those nasty cold symptoms but also helps your body stay healthy too. This delicious tea is made with simple ingredients that you may already have in your home. This soothing tea honey, lemon, and fresh ginger. 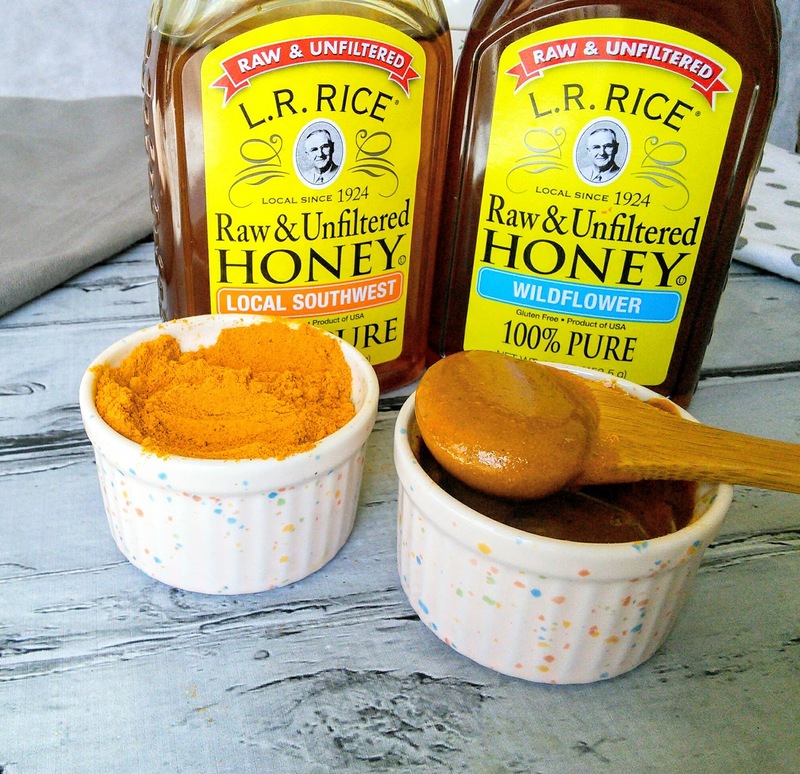 These ingredients help soothe a sore throat and clear all that gunk from your sinuses. Last year when my teen had a bad sinus infection, he said it really helped him feel better. The teen also loved the taste of this tea. 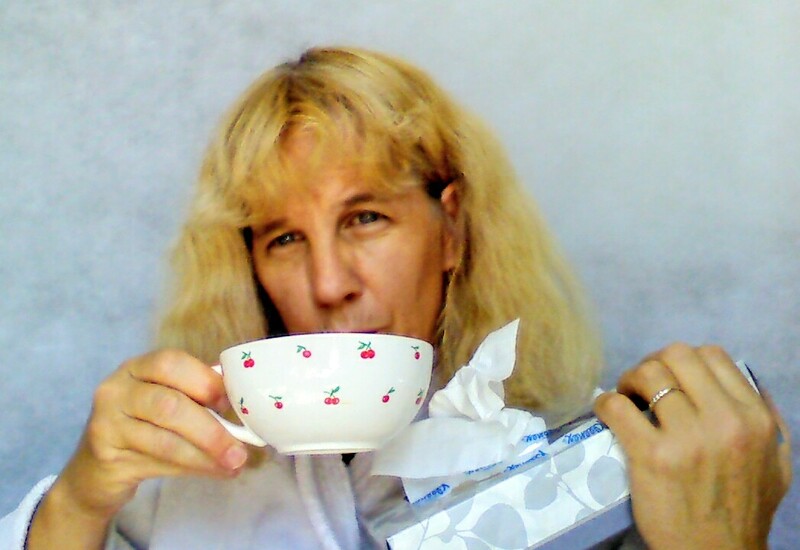 I like to consume this tea to strengthen my immunity so I don’t get sick when my kids are spreading those germs. Since the tea requires fresh ginger, I like to keep some fresh ginger in my freezer, so I always have it on hand. Who wants to run to the store when they are sick? Yes, you heard that right, I keep fresh ginger in my freezer. 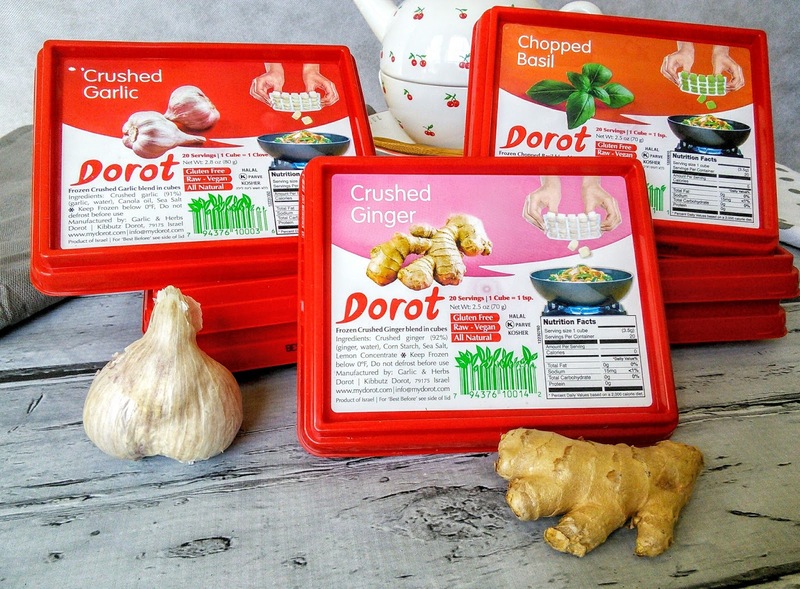 Dorot makes it so easy to keep fresh herbs and spices in my freezer. These little nuggets of herbs are so much fresher than what you buy in the produce section as Dorot flash-freezes the herbs within 90 minutes after they harvest it. One little nugget of ginger is equal to one teaspoon of fresh and requires no peeling. I just pop one cube into my tea and I get the great benefits of ginger with no fuss. These nuggets also last longer too as my freezer keeps them fresh. How many times have you bought a big thing of fresh ginger root with intentions to use and ended up throwing most of it away because it started to rot? I also keep other Dorot fresh herbs in my freezer as my teen loves to cook with them. The teen just loves to use fresh basil and garlic in his pasta sauce. I tried growing basil for him but it quickly died as I have a black thumb. Having a supply of Dorot basil in the freezer makes the teen so happy. 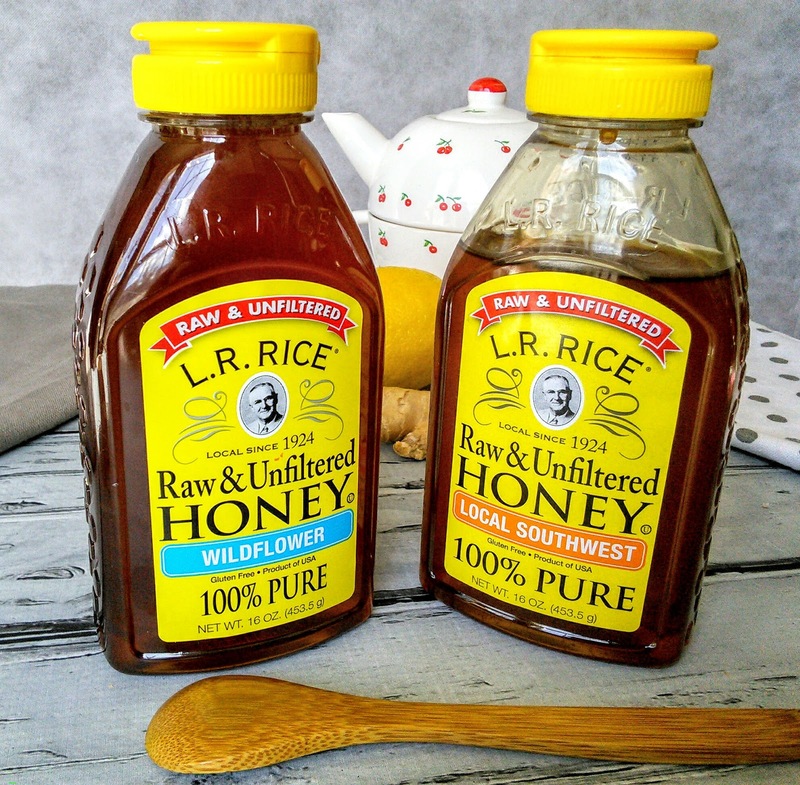 I love using Raw and Unfiltered Honey in my tea as it is 100% pure honey. If your bottle of honey is not 100% pure it may be just sugar and water. I like my honey to come straight from the bees with nothing added, that way I am getting all the good nutrients. L.R. 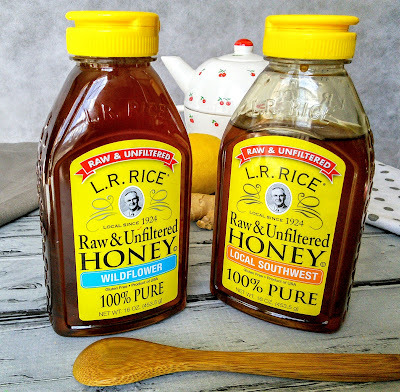 Rice has been producing honey since 1924 and manufactures it in Colorado. They produce honey from bees from all over the United States so you can get honey that is local to your area. My favorite L.R. 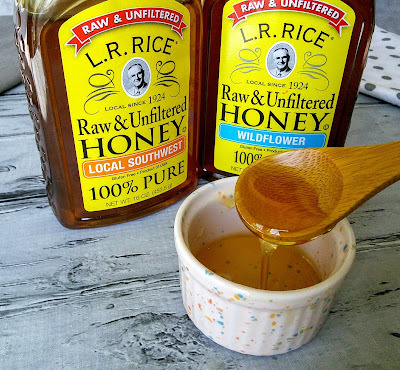 Rice honey is their Southwest blend. I like that bees in my area make this delicious honey from flowers that are local to my area. I also use honey when I make a mouth sore relief paste for my son. My youngest son tends to get mouth sores several times a month from allergies and I make a relief paste with turmeric and honey. This paste does a great job of healing the mouth sores. I just mix a teaspoon of turmeric into a tablespoon of honey. My son just applies the paste to the mouth sores with a cotton swab and it gives my son relief. Place all the ingredients in the boiling water and let brew for three to five minutes. You can drink the tea with the lemon slice in the cup or remove it. 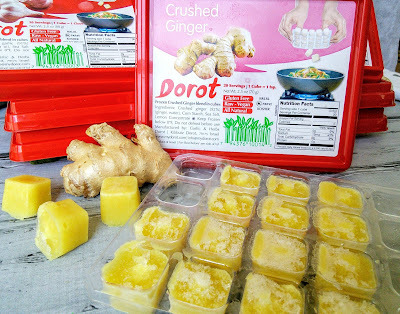 If you do not have any Dorot ginger, you can also use a one-inch piece of fresh ginger root. The heat and the ginger will warm you up and the steam aided by the lemon and potent ginger will help clear the sinuses. The honey will work to soothe a sore throat. Try this Honey Lemon Ginger Tea next time you are sick or feel a cold coming on. This came at the perfect time for me! My kids gave me whatever cold they have and I definitely need something! Thank you! I have never seen fresh ginger in the freezer at my grocery store, but it sounds perfect to keep on hand. I love using honey and ginger when I'm sick, but I have never thought to add the lemon. Great post, I will be doing this next time I am sick. Tea with lemon and honey are my go-to's during cold season. I'm definitely going to look into the Dorot products, those look amazing! This home remedies came at very perfect time as my niece is suffering with Cold and Flu. I love using honey in fall season that makes cold and flu stay away from me. Thank you for sharing an amazing post. I will share it with my colleagues. Oh we drink a lot of tea during cold and flu season. This looks like a great product. I've never seen this, but I'll be looking for it! My husband JUST asked me to get him some fresh ginger for tea. Thanks! Definitely bookmarking this for the future. I would love to not need this information but it is New England and winter is coming. This is my favorite combination during the flu season and it will certainly kick the flu out the air. 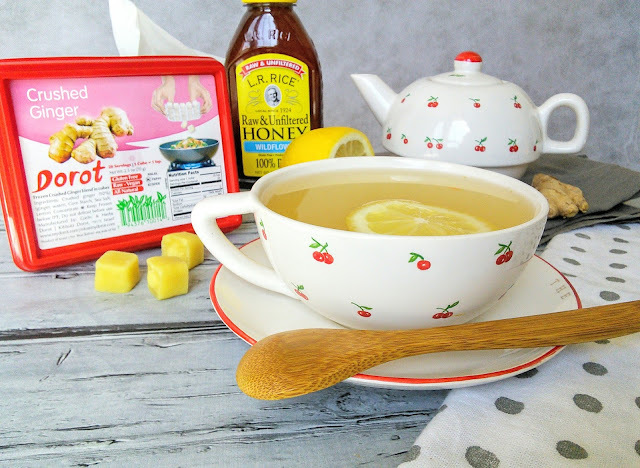 I am not a huge fan of honey, but it work so well with lemon and ginger. My children and hubby, always ask for a mug during this time of year. I'm going to try this the next time I get a cold. I'm the biggest baby when I'm sick. I need to stock up on the ginger. I hate being sick and it's honestly about the only time I drink tea BUT never like this! I will be adding all these ingredients to my shopping list and making sure I have them in stock for when any cold germs try to attack. Thanks so much for sharing! Yep these are all these best ways to get rid of the nasty cold! I really don't like getting sick so here is to staying healthy!! I needed this recipe 3 weeks ago! I was so sick, plus I'm pregnant so I couldn't take much, this sounds like the perfect herbal remedy for next time! This is a great way to feel better. Honey always does wonders for my coughs when I'm sick. Great idea to keep fresh ginger in the freezer! I have tried a similar tea when I was sick, and it was amazing. I bet your recipe works just as well!